Scooper - Technology News: Wage inequality: is it a question of where you work not who you are? Wage inequality: is it a question of where you work not who you are? Income inequality has risen throughout the advanced world. Among major countries the US is the leader in inequality (Piketty and Saez 2014), but in the past decade or so it has risen more in Sweden than in any other OECD country (OECD 2015). Thanks to the Wall Street occupiers, the increase in the top 1% has received most of the attention (Atkinson et al. 2011). Explanations are plenty, such as the effects of globalisation and technological change (Goldin and Katz 2008, Acemoglu and Autor 2012) or the weakening of trade unions (Machin 2016). With very few exceptions, however, they all take the same departure and focus on who you are – your skills, whether you are a union member or not, your gender, ethnicity, and so on. Our new work shifts the focus – it depends on where you work (Barth et al. 2016). Figure 1 illustrates the point with data for the US. The upper line shows the development of the variance in log weekly earnings from 1977 to 2010, calculated from the March Current Population Survey (CPS) conducted every year. The bottom line shows the development of the variance in the residual from a log earnings regression, conditioning on years of education, Mincer experience and its square, and race, all interacted with gender. Considering the widening of the earnings distribution, it looks like everything is in the residual.1 So, what is in the residual? Our analysis says what is in the residual is the distribution of average earnings across establishments, which we measure as the wage bill per employee from the US Census Bureau’s Longitudinal Business Database (LBD). 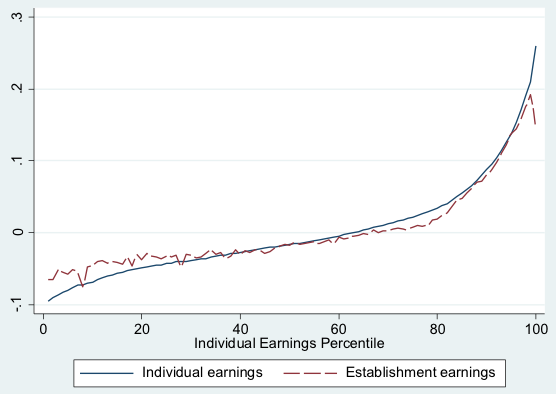 The middle long-dashed line in the figure shows that inequality in the average earnings among establishments increased at the same pace as the residual and is of sufficient magnitude to explain the bulk of inequality and the trend of inequality among observationally similar workers. Put differently, the widening of the residual earnings distribution results from a widening of dispersion across establishments, rather than from a widening across individuals within establishments. Because the data in Figure 1 come from different sources, however, we needed additional data from a single source, with information on individual workers and the establishment for which they work, to perform an analysis of variance that nails down this claim. 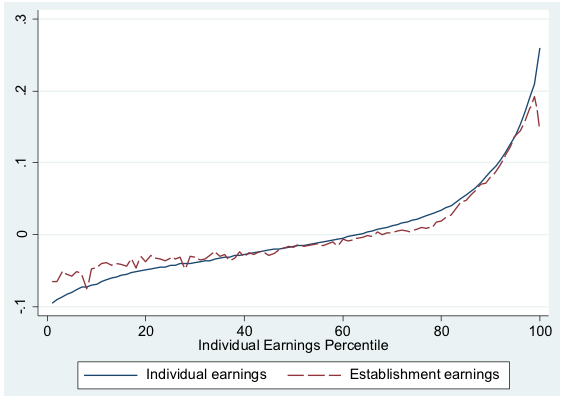 The widening of the wage distribution across establishments benefited the top earners the most. Figure 2 (from Barth et al. 2016) illustrates this point. The solid line shows the growth from 1992 to 2007 in the average earnings level of each percentile of the individual earnings distribution. The dashed line shows the growth in the average establishment component of the individuals in each percentile. The patterns are very similar, again showing that the widening of the wage distribution across individuals arises from an underlying widening of the establishment distribution. The widening of the wage distribution across establishments is not only a matter of certain industries taking off. It happens within industries as well, and even within establishments within the same firm. Freeman (2014) shows how it has been happening within the hotel industry in the US, and similarly, within the hotel industry in the Boston area. This is not only about industry and region, it is about establishments becoming further and further apart. The evidence that the bulk of the increase in inequality in the US occurred by establishments moving apart in earnings space raises new questions about wage determination and the power of competitive forces to compress wages toward the single market-clearing level of the most basic economic theory. Rent-sharing models, efficiency wage models, and dynamic monopsony models of frictions in the labour market generate wage differentials across employers beyond those associated with individual worker productivity. Earlier work on wages (Dunlop 1957) and the balkanisation of labour markets (Kerr 1954) pointed out the dispersion of pay among workers with different skills, but did not have the appropriate data to examine changes over time. Why does the US labour market, arguably one of the least institutionalised and sensitive to supply and demand, prevent establishment differentials widening so much? Where is the equalising force to eliminate these establishment wage differentials? How wages respond to the heterogeneity of employer conditions, and to changes in those conditions, matters greatly for the efficiency of the allocation of resources and for incentives to innovate and implement new technology (Moene and Wallerstein 1997, Freeman and Kleiner 2005). On the one side, the widening dispersion of wages would seem to sabotage the creative destruction of dynamic markets. Low and falling wages at the bottom of the wage distribution may allow low productivity firms to remain in the market instead of exiting, while at the top of the distribution increasing wages at the best firms would likely reduce their acquisition of more workers. The observed increase in inequality among establishments has implications for the direction of policies to reverse the trend and eventually reduce inequality. To the extent that the change in inequality among establishments reflects the weakening of unions to establish ‘level playing fields’ in a sector, and/or of worker mobility across firms to do the same, policymakers should shift some of their focus on individuals and their skills to strengthening employer policies and institutions that determine the differences in pay among individuals. To make headway against inequality requires both blades of the market scissors – demand as well as supply – employers as well as workers and the institutions that influence pay differences among establishments and firms. Dunlop, J. (1957) "The Task of Contemporary Wage Theory." In George W. Taylor and Frank C.
Pierson, (eds.) New Concepts in Wage Determination. NY: McGraw-Hill, pp. 117-39. This is not entirely true; this picture does not show the growth in dispersion due to the well known widening of educational differences (Goldin and Katz 2008) because this widening is counteracted by a narrowing of the distribution of earnings across gender over the same period, producing a relatively stable situation in the overall variance of the predicted earnings over time. We have obtained a measure of education by merging it in from the Decennial Censuses to the Longitudinal Employer Household data base for an 18% sample of the population. Increased worker-worker assortative matching explains nothing, whereas an increase in the assortative matching of workers to establishments explains some (about 11%) of the widening. Note, however, that this latter sort of matching between workers and establishments would not matter if there were no establishment component to pay in the first place.